Congratulations to all the Tour de France riders that made it safely to the finish line in Paris today. I was very happy to see Cadel Evans finish second behind Alberto Contador and only eight seconds ahead of Levi Leipheimer. I had the great pleasure of working with Cadel (and the entire Predictor-Lotto team) earlier this season on how to incorporate Training Peaks software to manage his training and race data. Training Peaks also had several other finishers in Paris today and it has been a dream come true for me to work with these professionals. This year's Tour will certainly be remembered for all of the doping turmoil and less than honest play by several riders. However I do take satisfaction in knowing that cycling is holding itself to the highest of standards. Unfortunately, if other sports implemented the same stringent rules as cycling I'm sure we would see the same, if not more scandal at major events. I'm proud that cycling is taking such a hard stance on drug use, and I'm also proud to work for Training Peaks which is a part of the anti-doping program for several teams and national federations. -Will Michael Rogers make a strong comeback after having to drop out this year due to a crash. -How far can super Spaniard Contador go? Will he win five more Tours? He is only 24 years old. -Will T-mobile remain in the sport after so many setbacks. T-Mobile deserves a huge thanks for all of their anti-doping efforts and support of cycling in general (PS. I also have T-Mobile cell service so I'm a proud customer too:). -If T-Mobile does stop supporting the team I would love to see Michael Rogers become teammates with Cadel Evans. That would be an amazing Aussie duo!! What a sad day for Michael Rogers and the T-Mobile Team. What started out as a perfect day for the Australian leader of T-Mobile turned out to be the worste day of his racing career. Michael crashed on the descent of the Roseland climb and hurt what seems to be his hand and shoulder. He abandoned after having fought hard for about 20 kilometers. Oh how quick the Tour changes. I just hope he can take a good rest now and refocus his long term goals on the 2009 Tour now. 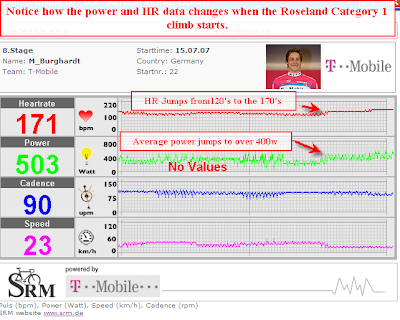 Marcus Berghardt data on the Roseland category 1 climb. 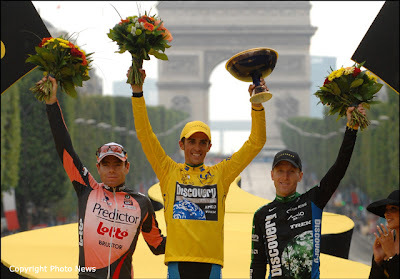 If you ever wanted to download same day Tour de France power files for analysis check out the Tour de France page here. This is your chance to dig into actual race files and imagine yourself as a team coach. Many thanks go out to Christian Vandevelde and SRM for providing us with this opportunity to show the world just what it takes to finish the Tour de France. -After comparing his 2006 files Christian has already beat his 2006 max 30-minute value. Yesterday Christian averaged 331w for 30 minutes (This happened in the final two hours of the stage on the Haut Folin climb). Christian had a maximum 30-minute value of 322w in 2006. -Yesterday's stage 5 is also the largest work load of any file we have received with a Training Stress Score (TSS) of 326. -Christian coasted (zero watts!) for 22% of the time after analyzing the seven 2006 files archived here. What do you find of interest? Download, dig in and share your thoughts. Thanks to SRM for all of their hard work in once again providing TrainingPeaks.com with daily live data tracking from the Tour de France. Logon and be amazed at the enormous numbers these guys pump out on the climbs and in the sprints as it happens live! It is quit amazing to be able to watch the Tour on television at the same time as viewing rider data.